Trying to work your way through the maze of state and federal regulations that have a direct imprint on veterinary medicine can be daunting, to say the least. All veterinarians want to do is practice medicine, but in reality what you practice is regulated veterinary medicine. That’s where the OVMA comes in: to help you to better understand the hundreds of regulations that affect you and your colleagues in clinical practice – and, whenever possible, to change such impractical rules and regulations so that they are less burdensome and more practical. The OVMA persuaded Radiation Protection Services to rescind a proposed rule that restricted a veterinarian’s decision making with regard to taking an X-ray of a patient. 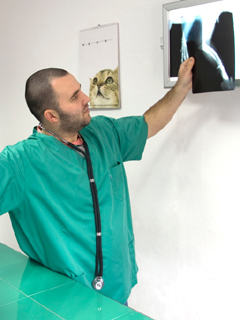 As a result of our actions, RPS modified the rule, allowing you the necessary professional discretion when it comes to the restraint of a dog, cat, horse or other patient for radiographs. While compounding is permitted – and even necessary – at times in veterinary medicine, the laws and rules that govern the practice are imprecise and can even be a bit murky. The OVMA has worked closely with the Oregon Board of Pharmacy to grant veterinarians more latitude on using and dispensing compounded drugs than what is allowed in most other states. An OVMA survey documented cases where some pharmacists overstepped their bounds and changed a veterinarian’s prescription by either altering the dosage of the drug or substituting the prescribed drug with an equivalent product – all without authorization of the attending veterinarian. We shared the survey results with the Federal Trade Commission and have worked closely with the Oregon Board of Pharmacy to address veterinary concerns. We also have developed an informational sheet for clients, entitled Caution about Pet Prescriptions, and a guideline for veterinarians, entitled Prescriptions and Pharmacies: Points to Consider. An increasing number of states have adopted an onerous and burdensome reporting program for controlled substances. While the Oregon Board of Pharmacy has been directed by the state legislature to consider implementing a similar program, the agency has not taken any action – but the topic is on OBP’s radar. Veterinary clinics in Idaho and Washington, among several other states, must comply with similar-enacted laws, all of which are cumbersome and costly. The OVMA will continue to monitor this and seek an exemption for veterinary practices if rules are proposed in Oregon.